Because vasculitis is caused in part by an overly active immune system, the treatment usually involves the use of medications that suppress parts of the immune system. The most common treatments of vasculitis are discussed below. The vasculitic diseases are serious disorders, and often require potentially dangerous treatments. For our readers’ benefit, we discuss most of the potential side–effects of medications used in the treatment of vasculitis. All of the medicines have a frighteningly long list of possible side–effects, but we emphasize that many of the side–effects can be avoided through careful management by experienced physicians. The risk of some side–effects can be reduced by taking supplementary medications along with those specifically intended to treat vasculitis. Click below for more detailed information on each medication. 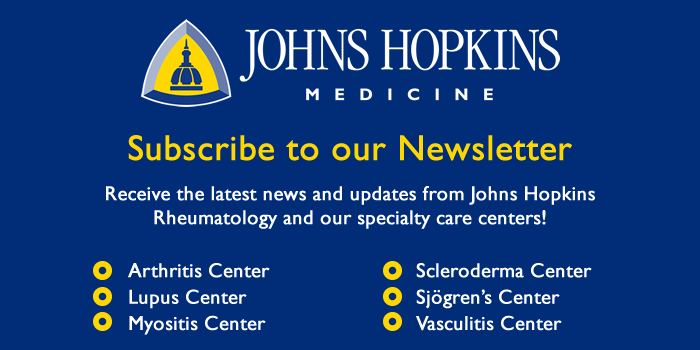 All information contained within the Johns Hopkins Vasculitis Center website is intended for educational purposes only. Visitors are encouraged to consult other sources and confirm the information contained within this site. Consumers should never disregard medical advice or delay in seeking it because of something they may have read on this website.